When you see cashew nuts what do you think? That they make for excellent snacks? That you can not eat the whole plate even if you wish to? That the kaju bafri (an Indian cashew nut dessert) tastes sinfully awesome? 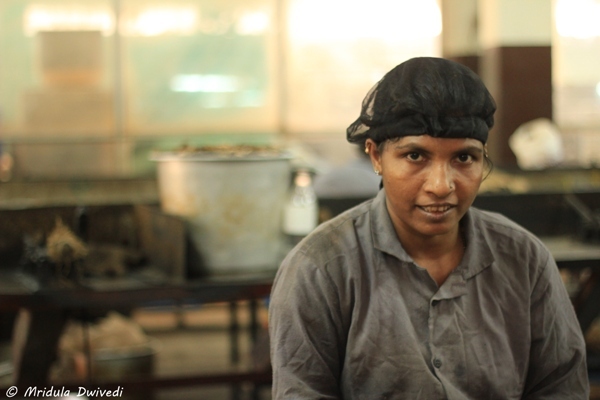 I too thought about cashew on similar lines, till I visited a cashew processing factory in Goa. My thoughts about cashew are never going to be the same again. After plucking it off the tree, once the nut is separated from the cashew apple it is left for drying for approximately eight hours. I have to admit I had never seen so many cashews at one place ever before. As the shell of the cashew is still intact it cannot be eaten. 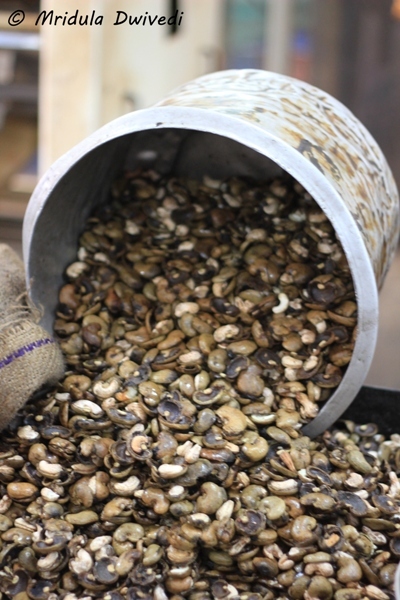 The dried cashews are then put inside a boiler. The amount of heat this machine generates can be believed only after experiencing it. 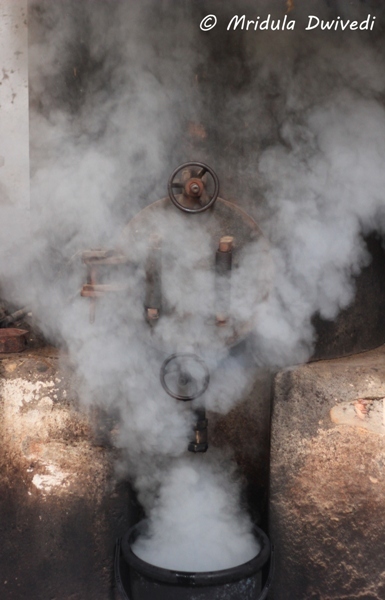 Belching smoke, it went about its task with the mechanical efficiency it was designed for! The machine spits it out after separating the shell from the nut. After this stage human beings once again come into the picture prominently. 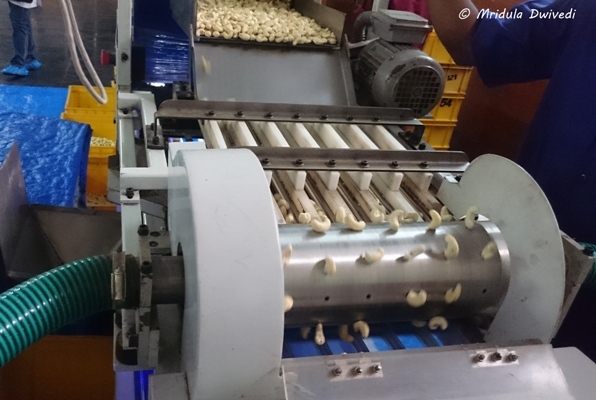 The shells and the nuts are separated by workers and not by machine. I found a lot of women working in this unit. While I was at the cashew farm and handling the cashew apple, I was told to be careful as the juice stains are hard to get rid of. And yet people separate the nuts and the shell for hours getting their hands deeply stained. That is how they make money! They separate it with a sharp needle like thing, where any mistake would lead to injuries to the hands. The women were so adept at separating the two that their hands moved at a frantic pace and they hardly ever looked up from their task. She was different. She gave me an eye contact with a shy smile. I requested her for a picture for which she happily agreed. I am sure if I did such messy work, I would not smile so readily. And did I mention the heat? The whole factory was hot. We complained incessantly about it and breathed a deep sigh of relief when we got out. And yet people go in there willingly every working day! And they smile at strangers with cameras. Once the nut is separated it goes through further processing to dry it out. After that it is all about sorting the cashews. It is sorted, sorted and then sorted again and again and again! At the first stage the sorting was done by machines. The whole nuts would fall in one tray, the once broken into twos in another. Then there were two more trays, one for the nuts broken into four and the other for some that were crushed to the bits. Then came the hand sorting for the nuts that were whole. You can count at least 7 vessels in the picture as the lady is sorting them according to as many aspects. Some of it involved sorting it by color. Then the cashews were sorted by a machine one more time. The holes on the rotator were of different sizes and the machine after picking them according to size drops them into different trays. 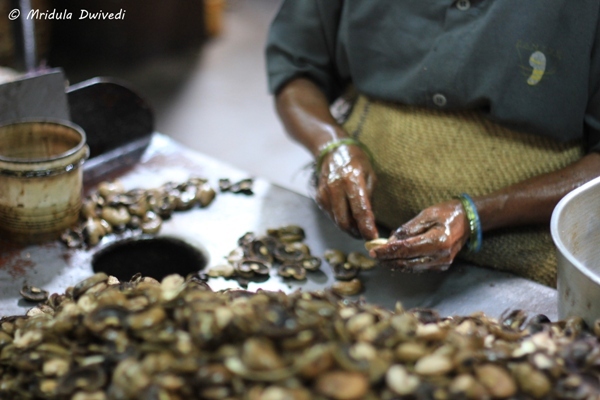 Did you ever realized the amount of work that went into bringing the cashews to your table? Finally after a lot of sorting the cashews got dropped into a giant bag, they were weighed and then sealed at a machine nearby. 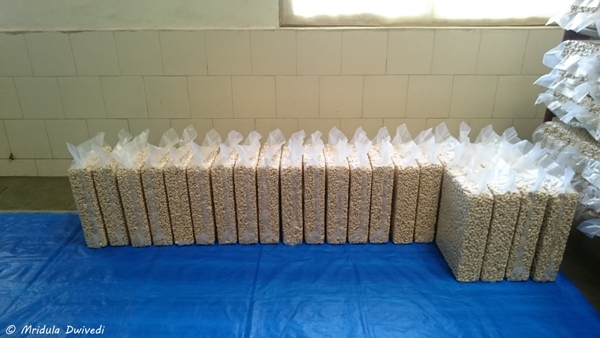 We were told that all the cashews from this particular batch were for export. 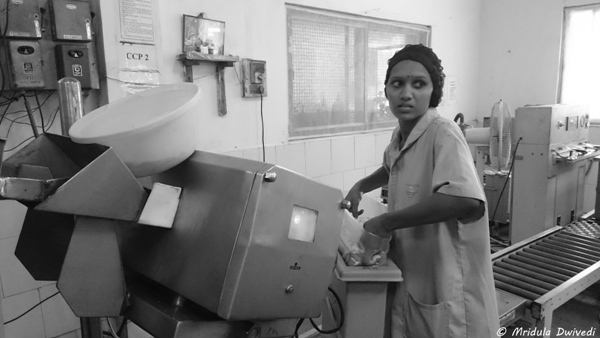 We had to wear aprons, head gear and foot gear to enter the sorting part of the factory. We were happy to discard then as we got out, the heat was something to reckon with inside the premises. 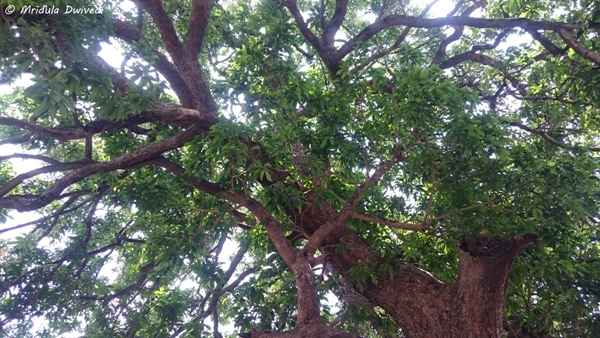 As I finally stood beneath this giant tree, breathing in deeply, I was sure of one thing, I will never take cashew nuts for granted again! I know the amount of work that goes behind the scenes to bring it to my table. Secondly I would like to remember the cheerfulness of people working in what was the ‘hot’ factory for me. 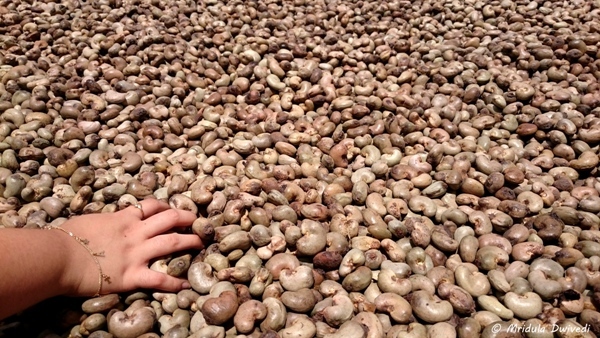 I don’t think I can contemplate spending a whole day inside a cashew processing factory. 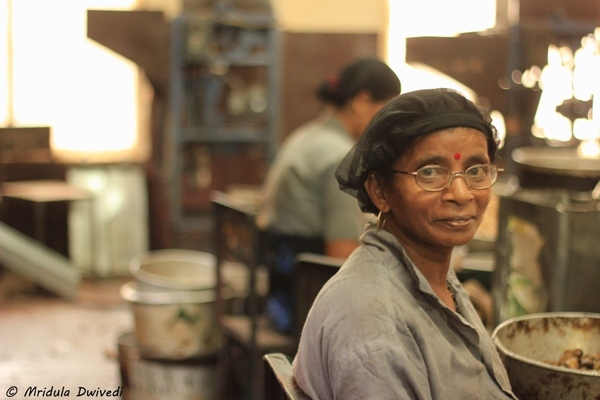 This is a note to self then, to remember the factory and its cheerful women, the next time I wish to go on ‘life is so unfair’ trip because of a trifle that irritated me.